So, at the recommendation of ATL Bite Lifer Shannon, I ventured over to Ponce in the middle of the afternoon a few weeks back to grab a bite a Papi's. It was a very random trip. But, I go through these random feelings fairly often nowadays. I've grown so bored with chicken and burgers that I'll search Scoutmob or ask friends on Twitter for suggestions on something new. 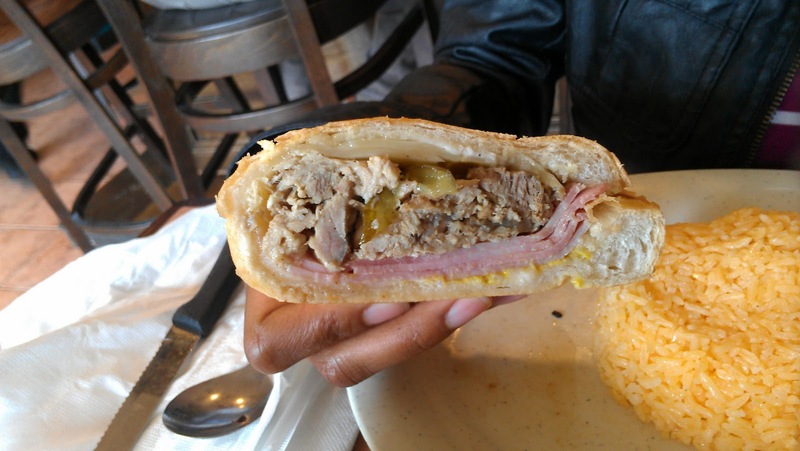 Today's taste was Cuban. 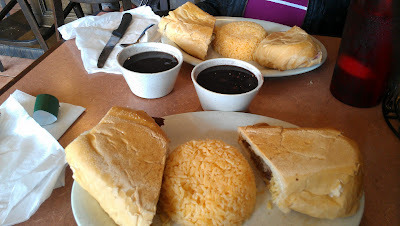 Now, prior to this day, I'd NEVER had Cuban food before. But, I'd heard about it, it seemed interesting, so I went. There are 2 entrances into the restaurant (I didn't know that til later). One on the Ponce De Leon side and the other on Myrtle St. I parked at a meter on Ponce and entered from that side. I walked up and this place seemed very small which confused me at first. I had heard stories of people coming in and sitting down and enjoying lunch here but it seemed kinda impossible given the space in front of me. As I was just about to order something to go, a waiter led me downstairs to a bigger dining area with tables and a bar. This was more of what I expected. However, as I'm sitting at my table, I notice that this place is getting busier and busier and there really weren't enough seats to accommodate the crowd. And, since there was no real lobby, people just ended up standing by the Myrtle St entrance door and hovering over nearby tables. I definitely wasn't crazy about that. Finally, my waiter appears. He hands me a menu and, honestly, EVERYTHING looked good. The prices were more than affordable and there were about 12 items that I wanted to try just because of the menu descriptions. 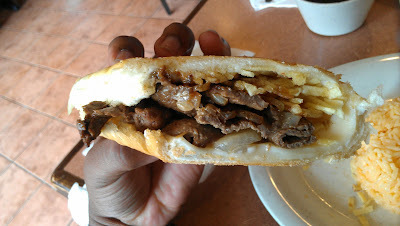 But, seeing as how I was a rookie with Cuban food, I played it safe and ordered 2 different sandwiches - the Authentic Cuban Sandwich and the Pan con Bistec (steak) with a side of yellow rice and black beans. In my mind, I was preparing my mouth for a delicious, filling, fairly spicy meal. What I got was - full. Let me say this - the food wasn't bad. It just wasn't what I expected. When the food hit the table, it smelled heavenly. However, the sandwiches were pretty tame. Nothing really jumped out at me. And the rice and beans were just. . . rice and beans. Maybe my expectations or assumptions were off but I felt a little cheated of my "Cuban experience". In the end, I finished half of both sandwiches and ended up leaving the rest there. My server was really nice and he told me to come back another time and try something else. I think I would come back. I think there's something there on that menu that I would really like but it wasn't on my plate that day. 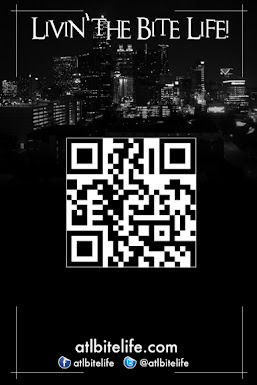 If any of you have been there and had a good experience, let me know. Tell me what I should've ordered. For some strange reason, I wanna give Papi's another chance. I've been there once. It's been two years now since I went so I cannot remember what I ordered; but I do remember it smelling good and not tasting as GREAT as it smelled (not saying it was bed. It was just kinda average). 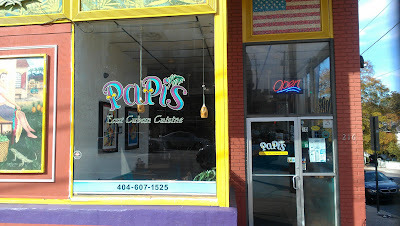 I love Papi's and when I went I had a good experience..the dish I that I had was really good and that you should try the next time that you visit was the Arroz con Pollo. Its a safe dish and super delicious! I gotta try that Arroz con Pollo. I hear that's good and safe just like I like. Lol. I heard their chicken cuban was good too. I really enjoy Papi's. Mixing the Pan con Bistec with some sweet plantains really round out the flavors, a little sweet and a lot savory.